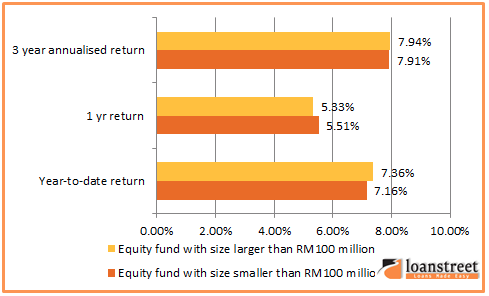 Unit Trusts (Mutual Fund) and Stocks are the two most popular investment products in Malaysia. We all know that unit trusts require less investing knowledge and stocks require higher individual effort spent on investment decisions. Hence, most Malaysians would go for unit trusts since most people are not equipped with sufficient knowledge when it comes to investments in stocks. In Malaysia’s context, the terms “Unit Trust” and “Mutual Fund” refer to the same product as both are actively managed by professionals. The fund company owns various funds made up of stocks or bonds and you purchase new shares issued by the company for ownership of the funds. Compared to stock investing which you also own shares in a company, you only buy or sell shares through the fund company. Also, when you buy or sell the shares, the transaction value is based on the Net Asset Value of the fund, which is derived by dividing (÷) market value of the fund’s assets, less (-) any fund’s liabilities, by the number of shares outstanding. Besides, in return for the fund management service, you pay the entry fee (also called sales charges or front-end load), exit fee (also called redemption fee, back-end load or deferred sales charges), annual management fee and trustee fee. Additionally, it is also common to pay other administrative fees such as switching charges and transfer charges. We will show you an example of how the fees affect your return in the later section. Unit Trust pools funds from individual investors to invest in diverse selection of stocks. In other words, a unit trust collects funds from us to do something big that individual investors cannot do due to lack of funds. One of the most evident benefits of investing in a unit trust is portfolio diversification, which helps to smooth out company-specific risks or asset-class-specific risks. You have RM1,000 to invest, and you intend to buy 100 shares (with the minimum amount of shares you are required to purchase in Bursa Malaysia) of a risky stock called “Company A”, priced at RM10. So, after buying shares of the “Company A”, you literally have no money left for other investments. On the other hand, the performance of your entire portfolio is solely dependent on the performance of the company. Having that said, if the price of the “Company A” goes up by 10%, your portfolio value will also go up by 10%, and vice versa. This is a very risky move, because your return can be very volatile. Think about this: if the price goes down by 10% (from RM10 to RM9), it requires an 11.11% increase to recover to the initial level (from RM9 to RM10). Similarly, if the stock goes down by 50%, it will require a 100% increase in order to recover to its original price. Wouldn’t you want a portfolio to generate an average of positive 5% annual return, rather than positive 10% in one year and negative 10% at the following year? This is where unit trust comes in. 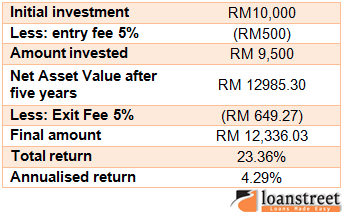 If a fund manages to accumulate RM1 million from many investors, and it invests equally in Company W, Bond X, Company Y, Bond Z, with 10%, 6%, -5% and -3% annual return respectively, the total return of the fund will be a positive 2%. This number may seem minimal, but basically, unit trust provides you with a safer option, in which your return is less volatile because of its portfolio diversification. So, what are the key things to take note of when investing in unit trusts? To choose the right fund, make sure that you know how much risk you are prepared to take. There are a lot of funds available, all segregated by different underlying risk levels. A higher risk level can possibly generate higher return, but it is not a guarantee that the return is always higher. There are a lot of cases where funds with moderate risk levels or even low risk levels can generate superior returns. In general, a higher risk level comes with a higher return during good times, but a lower return during bad times. So, if you cannot stand high-risk growth funds generating roller-coaster returns, you should go for moderate fund or even conservative fund with a lower risk level. How much is the fund holding in stocks and bonds? What are the specific stocks and bonds that the fund is holding? How high is the annual return from last year? What is the fund manager’s standpoint on the past year/quarter performance? What is the fund manager’s standpoint on market outlook? What are the risks involved in the fund allocation? How much pay does the manager receive? Fret not. You can find answers to these queries in the reports. In fact, an annual report is the only public information disclosed by the fund company. Therefore, this is the easiest way to understand the fundamentals of the fund. Good management team and consistent performance are the keys to choosing a good fund from all the funds in the market. ​The best way to know the quality of the management who invests your money is to ask them questions if you happen to meet them face-to-face. “Why do you buy/sell the assets?” is the simplest yet trickiest question because some managers who cannot explain their investment strategy clearly in a few sentences might spend a large chunk of time finding excuses for this mismanagement. Besides, past performances do not guarantee future return. Even though the past performance shows how well the manager is managing the funds, keep in mind that you should not only look for funds’ past performances during good years, but also keep an eye on how low the returns are during the bad years. Usually the bad years are the periods where most of the funds are not doing well, therefore minimizing loss is one essential skill that you would want your fund manager to have. Keep a closer look on the net return of a fund instead of the average return because net return is the profit that you’ll earn after paying all charges to the fund. On this matter, Total Expense Ratio is used to compare total fees charged by the fund companies. Lower expense ratio means less “annual salary” paid to the fund manager, which is a better deal for the investors. So, if the unit trust generates a 8% annual return with a total expense ratio of 2%, your return is roughly 6% before deducting any entry fee or exit fee. Looking at the table above, it is now clear that after excluding all expenses, your actual annual return is only 4.29%, which is a far cry from the stated 8% return. However, the fund companies do understand how these fees and charges affect their investors, therefore some funds have different fee structure in which exit fees or entry fees are waived. Nevertheless, do not mistakenly believe that higher charges equal to better performance. So please pay attention to how these fees and charges could disrupt your investment plans. Every fund will have its non-performing periods but sometimes these are triggered by the macroeconomic situation. Be patient about the stagnant returns as most likely other funds in the market would also suffer from the same situation. You should sell when you find something is not right. To make things simple, when the fund is constantly outperformed by the benchmark index or competitors’ funds, it could be the time when you should consider to sell. When a fund is growing very fast and the fund manager is expanding into different areas where he is not doing particularly well, it could threaten the profitability of the fund. Beware of the situation where the fund is holding a large amount of cash as this may be a signal of market downturn, or may be a signal of the manager who’s been struggling to generate positive return. Do large equity funds outperform small equity funds? The data above was extracted from morningstar on 24th of July 2015. The equity funds selected are at least 3 year-old with moderate risk level. Interestingly, there is no clear winner between a large fund and a small fund when it comes to annual returns. So, randomly choosing a small fund can average the return as much as large fund does. However, chances are that you might pick a fund that does worse than putting your money in your bank’s savings account. To avoid that, preparation is important to be able to choose the fund that you feel is right. In closing, the size of a fund may matter, and it also may not matter. Nevertheless, don’t overthink too much in taking the fund size into consideration when choosing a fund. Unit trust is probably the more popular way to invest as you’re paying a professional to invest your money if you don’t have much investment experience. Although this may seem to be an easy choice, choosing the right fund is just as important as choosing the right company in stock investment.